Brad Sweet picked up where he left off in Sunday’s Weld Racing Capitani Classic presented by Great Southern Bank, by dominating the Thursday Toyota Night qualifier for the 58th Annual 5-hour ENERGY Knoxville Nationals presented by Casey’s General Stores. The Grass Valley, California native took home $12,000 for his win in the Kasey Kahne Racing #49. Sweet also secured himself the pole position for Saturday night’s $150,000 championship event. He will be flanked by Ohio’s Chad Kemenah, while the second row will be comprised of Wednesday high point drivers Kyle Larson and Donny Schatz. Sweet started sixth in the 25-lapper, but wasted no time in getting to the front. He had the lead by turns three and four, ahead of Mark Dobmeier, Rico Abreu, Terry McCarl and Jacob Allen. Josh Schneiderman smacked the wall on the backstretch and slowed to a stop to bring a caution one lap in. Sammy Swindell spun a lap later, but fortunately, just avoided tipping over. The rest of the event went green. Sweet led the field back to green ahead of Abreu, who had passed Dobmeier, McCarl and Allen. Tim Kaeding moved into the top five on the restart, and then grabbed fourth from McCarl on lap four. David Gravel, who started 13th shot from sixth to fourth on lap five. Two circuits later, he worked by Dobmeier for third. Sweet jetted into lapped traffic on lap nine. He built a huge lead over Abreu that eclipsed four seconds with ten to go. There was no stopping the “Big Cat”, who took the checkers ahead of Abreu, Gravel, Kaeding and McCarl. Chad Kemenah, Cory Eliason, hard-charger Shane Stewart (from 23rd), quick timer Carson Macedo and Kraig Kinser rounded out the top ten. Sam Hafertepe Jr., Chris Martin, Dave Blaney, Swindell and Eliason won heat races. Don Droud Jr. took the C main, while Macedo claimed the B. Two firsts for the Knoxville Nationals occurred. Gio Scelzi, just 16 years, eight months and 14 days old this Saturday, will become the youngest driver to ever qualify for the championship event. That eclipses Jeff Gordon’s 1989 start at 18 years, and 15 days old. Also, Tom Harris of Banbury, Oxfordshire, became the first driver to compete at the Knoxville Nationals from the United Kingdom. The top sixteen drivers locking themselves into Saturday night’s A main in the first eight rows included Sweet, Kemenah, Larson, Schatz, Aaron Reutzel, Kerry Madsen, Tim Shaffer, Carson Macedo, Gio Scelzi, Tim Kaeding, Ian Madsen, Jacob Allen, Rico Abreu, Greg Hodnett, Shane Stewart and Terry McCarl. Those drivers who will start in rows one through five of Saturday’s B main include Parker Price-Miller, Lucas Wolfe, Daryn Pittman, Brock Zearfoss, Cory Eliason, Mark Dobmeier, David Gravel, Sammy Walsh, Austin McCarl and Kraig Kinser. Friday’s FVP Night will include the drivers who missed the top 26 in points. The top four finishers in Friday night’s main event will earn starting spots 17-20 in Saturday’s championship. The fifth place finisher will start 11th in Saturday’s B. The $10,000 Speed Sport World Challenge will also be run. If the winner of the race has not qualified already for Saturday night’s main event, they will be awarded the 25th starting spot. Two-time and defending World Series Sprintcars (WSS) champion James McFadden will start on the pole, alongside Lynton Jeffrey. The 58th Annual 5-hour ENERGY Knoxville Nationals presented by Casey’s General Stores continues with FVP night, Friday, August 10. There are still tickets available for the biggest event in sprint car racing! 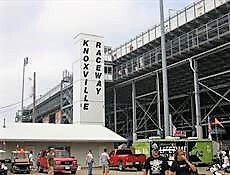 For more information, visit www.KnoxvilleRaceway.com!